“What’s wrong with the word wife?” I asked the two pairs of newlyweds. “I wouldn’t want to be called a wife,” said Pat, eyes rolling. “Yeah, and I think of derogatory expressions like fishwife and old wives’ tale,” Aeron said. I exhaled. 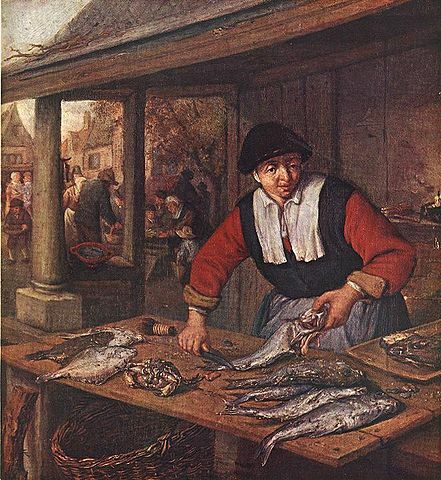 “Fishwife is an example of wife used in the sense Samuel Johnson described in his 1755 dictionary: ‘a women of low employment.’ The OED adds, ‘especially one engaged in the sale of some commodity.’ You don’t hear about apple wives, strawberry wives, oyster wives or alewives (except as the name of a fish) any more and fishwife survives only in the expression swearing like a fishwife. I think old wives’ tale has less to do with the word wife than with old-fashioned misogyny. In Old English old wife just meant an old woman. This entry was posted in Uncategorized and tagged fishwife, gays, marriage, old wives' tale, wife. Bookmark the permalink.